Saving online articles to read-it-later services like Instapaper or Pocket is a nice way of pretending to yourself that you’re eventually going to get round to reading through everything—but that’s easier said than done. Enter Short. Short is a small and simple app that surfaces articles by reading time so you can fit in articles at any point in your day. Built by Todoist developer Enric Enrich, Short works with Pocket, Instapaper (Premium), Readability and ReadingPack. Once you’ve connected up one or more accounts, you can quickly filter out articles that take less than five or ten minutes to read. 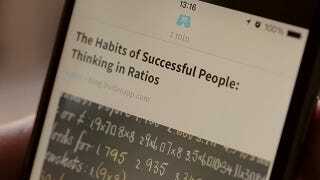 The reading time for every article is shown on screen and updated as you progress through it. There’s a stylish-looking night mode, the ability to archive articles from within Short, and the usual sharing integration options down at the bottom of the screen (logging in is handled by Twitter). If you’re finding your read-it-later lists just aren’t getting read, give Short a go and see if it can make a difference.